Enjoy the warmth and beauty of a new wood floor! This expert guide shows you how to buy and install a wood floor, and keep it looking great! Few home projects are as rewarding as installing a new wood floor. Whether you’re thinking about installing new wood floors or you just want to know how to care for the ones you already have, you’ve come to the right place. This section of HomeTips will help you assess the various types of wood flooring on the market, offer you step-by-step guidance on how to install a wood floor, and teach you how to repair and care for your wood floors so they offer lasting durability and practicality. From the deep, rich tones of oak and walnut to the bright, contemporary look of maple and birch, no other flooring material quite comes close to achieving the natural warmth of wood. That quality is, no doubt, what makes wood floors a clear frontrunner for homeowners when it comes to choosing between wood and other popular flooring options. You’ll find that there are many different species of wood used for flooring, and each has its own advantages and disadvantages. 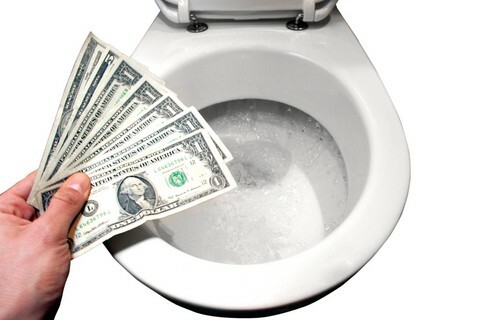 You’ll also discover a wide variety of applications for nearly every room of the house. Before purchasing wood flooring, you will want to educate yourself about the qualities of the different species and how each will perform in your intended application. For example, the wisest choice for a heavily trafficked family room will be different from that for a little-used guest bedroom. If environmental concerns will factor into your decision, you will also find discussion of bamboo flooring, reclaimed flooring, and other sustainable options. For a complete, unbiased wood floor buying guide, including quality, style, and trend information, see Wood Flooring Buying Guide. A wood floor, by the very nature of the material, is vulnerable to scratches, dents, and even gouges. 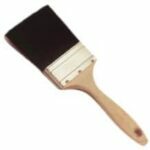 Minor surface damage can usually be taken care of with light sanding and then reapplication of the finish. More serious problems may require replacing portions of the floor. 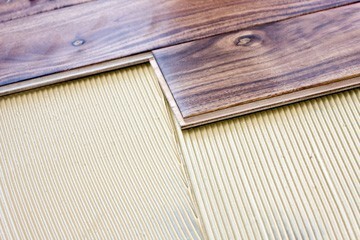 Caring for a wood floor is not labor-intensive but does require a regular regimen of vacuuming or wet mopping. Depending on the wood you choose, consult with the dealer about the proper finish for the wood, how often it should be reapplied, and the proper cleaning agents for it. 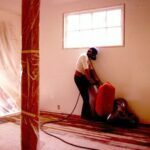 For more information on how to repair and maintain wood floors, including how to fix a squeaky floor, see How to Repair Wood Flooring. Engineered wood flooring is glued to subfloor. 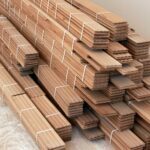 Hardwood floor installation is within the realm of even a moderately skilled DIYer, though proper preparation and attention to detail are as important as skill level. 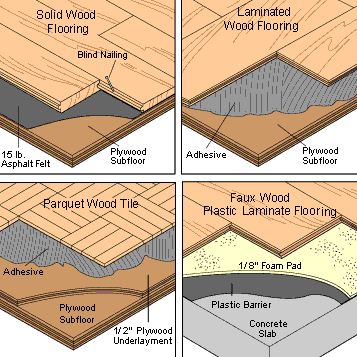 If you are thinking about installing a wood floor yourself, your first consideration will be the type of subflooring it will have—a wood-framed subfloor or a concrete slab—as the installation techniques differ. The next consideration is the wood flooring itself. All wood flooring needs to acclimate to the temperature and humidity level of the room where it will be installed. It should be unwrapped and allowed to rest for several days. Shortening or eliminating this step can result in any number of problems down the road, including warping, twisting, and buckling. For a complete discussion of how to install a wood floor, including step-by-step instructions, see How to Install a Hardwood Floor.